At a press conference on Tuesday, the Deputy Director of the Da Nang Department of Culture and Sports, Mr Nguyen Phuc Linh, announced that the Da Nang International Marathon (DNIM 2016), which will take place at the Bien Dong (East Sea) Park in Son Tra District on Saturday 6 August, will feature a wide range of charitable and exciting cultural activities. Mr Dennis Zaborac from the USA, a war veteran who was based in Da Nang, will be competing in the event. 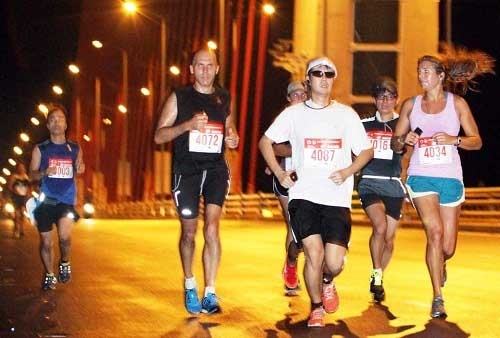 He has raised a total of 4,500 USD from generous donors, and the money will be shared equally between 3 of Da Nang’s charities – the Association of Agent Orange Victims, the Hy Vong (Hope) Village, and the Table Tennis Club for Disabled People.DNIM 2016 will comprise 4 races: a full marathon (42.195km) and a half marathon (21.095km), along with a 10km and 5 km run and walk. Most notably, between 50,000 and 200,000 VND from the fee of each registration for the 5km run and walk will be used to help 10 local very poor families. During the event, an interesting outdoor cultural event entitled ‘Happy and Healthy Family’ will be held. It will feature a wide range of such fascinating activities as physically active games and musical performances. According to a spokesperson for DNIM 2016’s organising board, the organisers are appealing for each of Da Nang citizens to become a tourism ambassador during the event. Locals are encouraged to either participate in the international-level event or cheer the participating runners in order to encourage them to successfully complete their race. Da Nang boasts beautiful landscapes, economic growth, a healthy living environment, and hospitable residents. It is, therefore, very attractive to domestic and foreign visitors. This will help the city to attract even more runners from across the world to participate in such events in the years ahead.